Inflammatory bowel diseases (IBD), including Crohn’s disease and ulcerative colitis, are lifelong conditions that often begin in childhood. Disease monitoring is usually based on clinical symptoms with an emphasis on altered bowel habits and rectal bleeding. As relying on subjective symptoms alone could lead to management errors, the use of faecal calprotectin as an objective and non-invasive measure of disease activity has gained a lot of interest in both paediatric practice and trial settings.1 2 Calprotectin is widely believed to be a stable marker, hence many physicians and researchers allow patients to send a stool sample to the laboratory by surface mail at ambient temperatures. However, evidence for stability at room temperature is scarce and all quotes can be traced back to one of the earliest scientific publications on stool calprotectin.3 We assessed calprotectin stability in stool samples stored at room temperature and at 4°C. In addition, we assessed calprotectin stability in extraction buffers. We collected 19 stool samples from patients with IBD and ensured that the whole range of potential calprotectin values was covered. Within 2 hours of collection spot samples were homogenised and split into 12 aliquots, six of which were kept at room temperature and six at 4°C for 1, 2, 3, 4, 5 and 6 days, respectively. Each stool sample was also extracted and split into six aliquots of extraction fluid and likewise kept at room temperature. We used ELISAs of BÜHLMANN Laboratories (fCAL), Preventis (IDK Calprotectin) and Calpro (CalproLab ALP), and pooled the calprotectin results per preanalytical condition. To minimise any batch-to-batch variation, all aliquots were analysed in the same analytical batch. A repeated measures analysis of variance was performed and results were plotted over time and expressed as percentage change from baseline calprotectin with 95% CI. Baseline calprotectin concentration in the stool samples varied from 14 to 3270 µg/g. In aliquots kept at room temperature the mean change from baseline values on days 1, 3 and 6 was 18% (95% CI 11 to 25), 28% (95% CI 22 to 34) and 35% (95% CI 26 to 44), respectively. This decline was irrespective of the calprotectin concentration at baseline. In extraction fluids kept at room temperature the mean change from baseline values was 23% (95% CI 9 to 37), 36% (95% CI 21 to 51) and 46% (95% CI 30 to 62). In aliquots kept at 4°C calprotectin values remained stable during the observation period (see figure 1). Calprotectin stability over time was significantly diminished in stool and extraction fluids kept at room temperature compared with storage at 4°C (p=0.0066 and 0.0011, respectively). Our results indicate a steady decline in calprotectin concentration in the first 6 days after stool collection in samples kept at room temperature. A similar slope was seen in stool extracts kept at room temperature, while the stability of calprotectin was preserved in samples stored in a refrigerator at 4°C. We did not test the superiority of one ELISA kit over another. For that, we would have needed to perform a multitude of tests. The decline in calprotectin concentration over time was observed regardless of the ELISA kit used, which makes inadvertently smoothening of the curve unlikely. Literature on calprotectin stability under various preservation conditions is scarce. A Swedish group observed a decline in calprotectin when stool samples were stored at room temperature for 7 days but claimed that the concentration remained unchanged in the first 3 days after collection.4 A Spanish group claimed that calprotectin remained stable in stool extracts stored at room temperature for 4 days,5 as opposed to our finding that extraction does not prevent a decline. Calprotectin instability in stool samples sent by surface mail at ambient temperatures may lead to management errors in treat-to-target strategies, in which physicians aim for calprotectin concentrations below 250 µg/g.6 Although there is no consensus on the optimal frequency of calprotectin retesting and cut-offs for treatment intensification, the authors of this article use the following monitoring strategy: patients with IBD with calprotectin values below 250 µg/g are reassured and advised to retest in 3 months; patients with IBD with calprotectin values above 500 µg/g are considered to have active disease, require treatment intensification and retesting in 1 month; and patients with IBD with calprotectin in the intermediate range are advised to retest in 1 month before progressing to a decision. 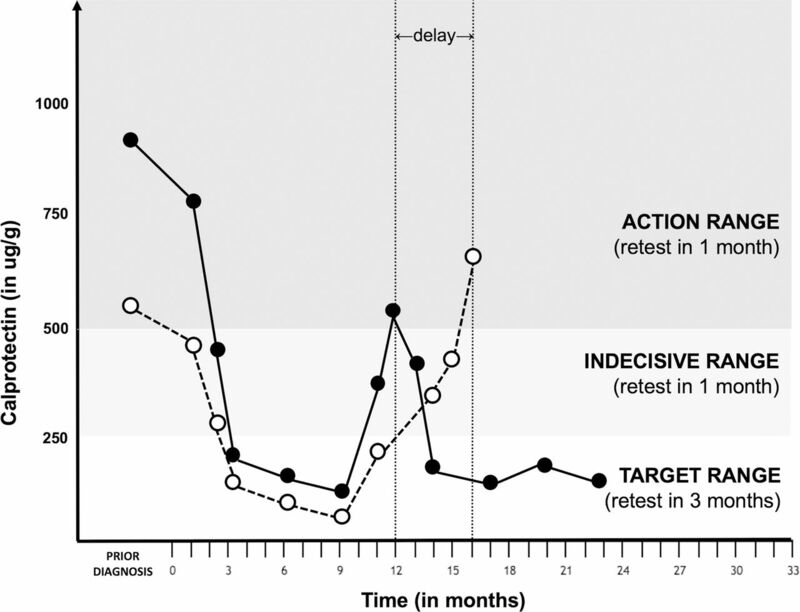 In such a strategy, patients whose calprotectin values show a drift from the target range into the indecisive range may be falsely reassured, leading to a delay in treatment intensification (figure 2). The intermediate range is exactly where precision is of utmost importance and small deviations lead to misclassification of disease activity and wrong treatment decisions. Test results at the high and extreme low end of the calprotectin spectrum will not lead to management errors. Stool calprotectin values of an imaginary patient with Crohn’s disease plotted over time. Black dots represent true calprotectin values, white dots represent underestimated calprotectin values caused by protein degradation in the preanalytical phase. In month 12, the patient’s true calprotectin measurement would have resulted in treatment intensification, while calprotectin degradation during transport may cause false reassurance and significant treatment delay. Currently, the best advisable standard for preanalytical calprotectin handling is refrigeration of the filled stool container until delivery at the hospital laboratory. Several manufacturers recently introduced a lateral flow-based test and a software application that turns an ordinary smartphone camera into a reader for quantitative calprotectin measurements.7 Although this innovation has great opportunities to take transport of stool samples out of the equation, home tests are not yet commonplace in monitoring disease activity in IBD. In the meantime, for those who continue shipping unrefrigerated stool samples to the laboratory, we emphasise the importance of documenting the time to arrival at the laboratory. Unrefrigerated stool samples that arrive with a delay exceeding 24 hours with a calprotectin concentration between 250 and 500 µg/g need confirmation. We currently advise our patients to store the confirmation sample in the freezing compartment of the fridge until the face-to-face encounter with the physician and then deliver the confirmation sample to the laboratory by hand.